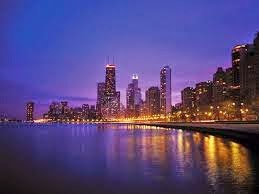 I was 17 when my father put me behind the wheel of our family car and directed me toward Lake Shore Drive in downtown Chicago. My drivers license was barely cool from the laminater after learning to navigate the rural roads near our home in north central Arkansas, but Dad used this family vacation as a learning moment for my driving career. "If anything will teach a new driver how to stay in his lane, it's this road," he said. I nervously entered the stretch of urban street that skirted Lake Michigan, amid mid-day traffic and four very full lanes of moving vehicles, all cruising at least 20 miles per hour over the speed limit. The road curves right and left along the shoreline, prompting a new driver to be attentive and not encroach another's lane. "Speed up so you aren't run over," Dad added. I gradually accelerated to the flow of traffic, aware that I was speeding at my father's guidance. I could see the Sears Tower (now Willis Tower) in the distance and felt the charge of excitement that always accompanies the view of an iconic city skyline. My hands were tight around the steering wheel while I held the car's position centered between the lines of my lane. Please don't ask me to change lanes, I thought. "You'll need to get over so you can exit soon," Dad said. Dammit. I am doing just fine in this lane and now you want me to merge?!? I must have checked my mirrors three times before tentatively easing into the right lane and exiting onto a downtown street. I am sure I let out an audible sigh of relief upon leaving that tense stretch of road in my rear view mirror, but that day has never left me. Since that moment, I have been very aware of the skills needed to drive consistently in the center of my lane, even in a curve. Immersion learning courtesy of Chicago traffic. At the time, I thought I was learning good driving skills, something my father stressed as necessary before going out into the real world without the protective eyes of parents. I often heard him comment on other drivers during our many road trips, usually noting a driver's inability to maintain consistent speed or general lack of driving courtesy. "You are not the only one out here," he would say while we were on one of my training drives. "Other drivers depend on you to be consistent and aware." Two years ago this month, I bore witness to two personal traumatic events which coincidentally occurred the same night but hundreds of miles away from each other. One was the end of a long-term marriage; the other was the suicide of a health care provider accused of misconduct. One was connected to my family; one was connected to a friend. Upon hearing the news of both of these events only hours apart, I was gob smacked to say the least. I was shocked and hurt, angry and sucker-punched. I was on the second-level of the storm, not the initial person affected, and still I felt as broken and depleted as if it had happened to me. When I looked to the two people first affected by these dual traumas that is when I saw what real pain looked like. These two people, each suffering from their separate blows, lay crumpled in heaps -- both physically and emotionally -- neither in any condition to navigate even one step before them. I had no idea how to help them, other than to just be there. After mopping up my emotional reaction to the dual events, I felt the only thing I could do was to stay in my lane and look out for the others. Remaining consistent -- reliable -- was the best thing I could do to help my family and my friend. Sometimes, it's all you have. And it's not such a bad thing to offer. I may not have the right words to wash away a friend's pain; I may not have the answers to explain the unexpected occurrences of the world. I may not have much insight to that. But I can be a constant. I can be the consistent one who steers the day between the lines and watches out for the others on the road. I may not understand the pain another feels in these moments, but I can be the constant place on whom they can rely to get the normal stuff done while their worlds fall apart and come back together. It may not be much, but I can keep it between the lines and maintain a constant speed. Every evening on my drive home from work, I round a long curve on the highway where there are always several cars in each lane. It's no Lake Shore Drive, but it is two narrow southbound lanes of a U.S. highway that always weeds out the adept drivers from the fearful ones. Some cannot stay in their lane and cause a few tense moments as they slip into the next lane and near another vehicle. Some slow down in such fear of the curve that they impede the flow of traffic and soon have a bevy of frustrated drivers behind them, honking and swearing. Still others show a keen ability to navigate the curve at full speed, never budging from the middle of their assigned lane. They are the ones to watch. They are the constants. Throw them a curve and they plow right through it, focused and determined. They are aware of the others and compensate for the errors of those nearby. But they stay in the middle, centered between those two painted lines. Predictable, perhaps. Consistent, yes. But in the midst of a trauma, an upheaval, a tragedy, isn't it nice to have a place of refuge where you know what to expect? I love this Rita. Really love it actually. Such a great scribe and analogy. And, you know what, being a constant is exactly what is needed while a loved one's "world falls apart and come back together." How did I miss this? You, my friend, understand as no one else has. Life goes on for most, events mostly forgotten. Some things, tragically, stay with us. Sharp pains becoming dull. Lives altered. No resolution to be made.